Select trunnion block shim thickness to attain a handtight position between 20° to 55° from the locked position. The M2 machine gun shall be disassembled as necessary to accomplish the cleaning. All surfaces shall be cleaned with solvent cleaning compound (item 13, WP 0060 00). Preserve all surfaces of the M2 machine gun with LSA (item 21, WP 0060 00). Wrap with barrier material (item 2, WP 0060 00). Place in sleeve and tubing bag (item 1, WP 0060 00) or wrap with barrier material (item 2, WP 0060 00) and seal with paper tape (item 29, WP 0060 00). Place one or more of item in minimum size container. Block and brace in accordance with MIL-STD-1186. Cushion the M2 with cushioning material (item 15, WP 0060 00) and use fiberboard (item 17, WP 0060 00) as filler to create a tight pack. Fiberboard containers shall be in accordance with PPP-B-636 (item 4, WP 0060 00) and may be Class Domestic. Gross weight and size of the material shall determine grade of fiberboard container. Fiberboard boxes (item 3, WP 0060 00) may also be used. Wooden boxes shall be in accordance with PPP-B-601 (item 5, WP 0060 00) or PPP-B-621 (item 6, WP 0060 00). The unit container shall be packed in a wooden box (item 5, WP 0060 00). Nail top to shipping box. Serial number is required and shall be listed on the packing list. Packing list shall be put inside the shipping box. This work package includes complete instructions for making items authorized to be manufactured or fabricated at unit and direct support maintenance. 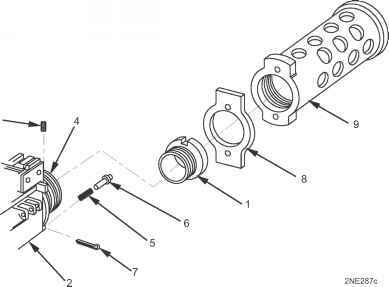 A part number index in alphanumeric order is provided for cross-referencing the part number of the item to be manufactured to the page which covers the fabrication criteria. 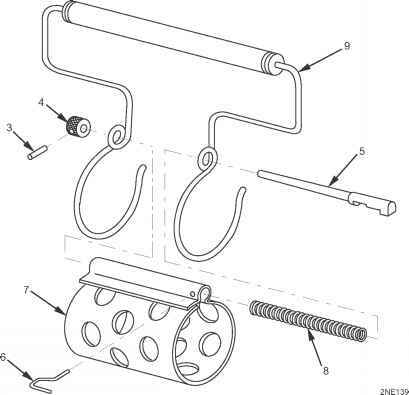 All instructions needed by maintenance personnel to manufacture the item are included on the illustrations. All bulk materials needed for manufacture of an item are listed by part number or specification number in a tabular list on the illustration. Fabricate from 20.5 in. (52.1 cm) long rod of 3/8 in. diameter brass alloy NSN 9525-00-249-7441. Wrap paper tape (item 29, WP 0060 00) where triangle joins. Table 1. List of Materials. Fabricate wire from part number found in Table 1. Cut wire to necessary length. This work package lists all field manuals, forms, technical manuals/technical orders, miscellaneous publications, and pamphlets referenced in this manual. This introduction provides a general explanation of all maintenance and repair functions authorized at various maintenance levels under the standard Army Maintenance System concept. Unit — includes two subcolumns, C (crew/operator) and O (unit) maintenance. Direct Support — includes an F subcolumn. General Support — includes an H subcolumn. Depot — includes a D subcolumn. The tools and test equipment requirements (immediately following the MAC) list the tools and test equipment (both special tools and common tool sets) required for each maintenance function as referenced from the MAC. The remarks (immediately following the tools and test equipment requirements) contain supplemental instructions and explanatory notes for a particular maintenance function. 1. Inspect. To determine the serviceability on an item by comparing its physical, mechanical, and/or electrical characteristics with established standards through examination (e.g., by sight, sound, or feel). This includes inspection and gagings and evaluation of cannon tubes. 2. Test. To verify serviceability by measuring the mechanical, pneumatic, hydraulic, or electrical characteristics of an item and comparing those characteristics with prescribed standards on a scheduled basis, i.e., load testing of lift devices and hydrostatic testing of pressure hoses. 3. Service. Operations required periodically to keep an item in proper operating condition; e.g., to clean (includes decontaminate, when required), to preserve, to drain, to paint, or to replenish fuel, lubricants, chemical fluids, or gases. This includes scheduled exercising and purging of recoil mechanisms. 4. Adjust. To maintain or regulate, within prescribed limits, by bringing into proper position, or by setting the operating characteristics to specified parameters. 5. Align. To adjust specified variable elements of an item to bring about optimum or desired performance. 6. Calibrate. To determine and cause corrections to be made or to be adjusted on instruments of test, measuring, and diagnostic equipment used in precision measurement. Consists of comparisons of two instruments, one of which is a certified standard of known accuracy, to detect and adjust any discrepancy in the accuracy of the instrument being compared. 7. Remove/Install. To remove and install the same item when required to perform service or other maintenance functions. Install may be the act of emplacing, seating, or fixing into position a spare, repair part, or module (component or assembly) in a manner to allow the proper functioning of an equipment or system. 8. Replace. To remove an unserviceable item and install a serviceable counterpart in its place. "Replace" is authorized by the MAC and assigned maintenance level is shown as the third position code of the Source, Maintenance and Recoverability (SMR) code. 9. Repair. The application of maintenance services, including fault location/troubleshooting, removal/installation, disassembly/assembly procedures, and maintenance actions to identify troubles and restore serviceability to an item by correcting specific damage, fault, malfunction, or failure in a part, subassembly, module (component or assembly), end item, or system. How to remove barrel support from M2 .50 cal? HOW TO DEMOUNT BARREL SUPPORT M2HB? How to m2 .50 worket?